NEWPORT NEWS, Va., April 15, 2013 (GLOBE NEWSWIRE) -- Huntington Ingalls Industries (NYSE:HII) announced today that the flight deck of the nuclear-powered aircraft carrier Gerald R. Ford is complete following the addition of the ship's upper bow section on April 9 at Newport News Shipbuilding (NNS). The upper bow extends the overall length of the carrier to its full size, which is 1,106 feet—equal to a 75-story building lying on its side. Weighing 787 metric tons and comprising 19 steel sections, the addition of the upper bow brings Ford to 96 percent structural completion. 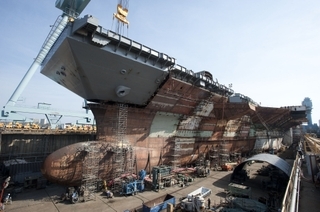 The carrier construction team began construction on the upper bow unit in December 2011. Ford has been under construction since November 2009. "Placement of the upper bow gives our entire shipbuilding team a great sense of accomplishment," said Rolf Bartschi, NNS' vice president, CVN 78 carrier construction. "We have now structurally erected the flight deck to its full length." Gerald R. Ford is being built using modular construction, a process where smaller sections of the ship are welded together to form large structural units, equipment is installed, and the large units are lifted into the dry dock. The upper bow unit is the 475th unit erected out of 496 used to build the carrier. It also is the 160th superlift to erect out of the 162 scheduled. It joins the lower bow section that was set into place on May 24, 2012, in the dry dock. The lifts are accomplished using the shipyard's 1,050-metric ton gantry crane, one of the largest in the Western Hemisphere. Gerald R. Ford represents the next-generation class of aircraft carriers. The first-in-class ship features a new nuclear power plant, a redesigned island, electromagnetic catapults, improved weapons movement, an enhanced flight deck capable of increased aircraft sortie rates, growth margin for future technologies and $4 billion reduced total ownership cost compared to a Nimitz-class aircraft carrier. The ship is scheduled to launch later this year.